Melting Pot Supper Club: Beetroot Marinated Salmon, Brilliant shades of Orange, Pink and Green. 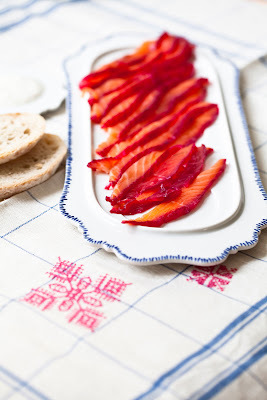 Beetroot Marinated Salmon, Brilliant shades of Orange, Pink and Green. 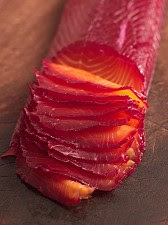 My favorite way of preparing salmon is the sweet and earthy beetroot cure whose dazzling shades of orange, pink and green seem more than appropriate for the festive table. Similar to gravlax, this salmon is marinated in coarse sea salt, demerara sugar, white pepper, wodka, and zest from a bounty of citrus fruits overnight (orange, lime, lemon), fresh dill and grated beetroot. What results is a beautiful beetroot infused salmon. A large piece of fish seems so extravagant, like a stunning jewel when presented. This dish is so incredibly good perfect for dinner parties or entertaining food. Oh, did I mention that it tastes absolutely phenomenal? Check the salmon for any remaining bones, keeping an eye open for the tiny. These can be removed with tweezers. Lay the salmon skin-side down on a stainless steel enamel tin or glass dish. Put the demerara sugar and salt in a mixing bowl. Roughly grind the peppercorns and add the sugar and the vodka. Roughly chop the dill and its stems, and add to the marinade. Finely grate the lemon, orange and lime zest and add to the sugar mixture. Peel and grate the beetroots, then stir into the other ingredients. Spread the mixture over the fish and rub in well with your hands. Wrap a piece of clingfilm over the fish and place a heavy weight on top. (A small chopping board with a few cans on top will work.) Refrigerate between 24 hours and 2 days. Slice the fish thinly and… enjoy!